Director Paul Thomas Anderson has gone where no director has gone before; i.e., he has attempted to bring a novel by the reclusive Thomas Pynchon to the screen. Those familiar with Pynchon’s work immediately will understand why this is such an audacious endeavor on Anderson’s part. Pynchon’s novels aren’t plot-driven, and frequently veer off into clouds of digression as he watches the social order break into bizarre fragments. If a Pynchon novel doesn’t always make sense in conventional terms, well, look around you. What really does? When I was in college during the ’60s, we were all devouring Pynchon’s V., a debut novel that revolved around a character named Benny Profane. Pynchon provided a counterweight to the formalized rigor of academic reading. We were smitten. We congratulated ourselves for getting “it,” whatever “it” was. 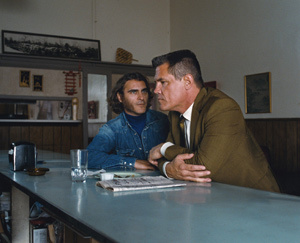 In Inherent Vice, Anderson dips into Pynchon’s 2009 neo-noir fantasy, an LA-based story that introduces us to a character named Doc Sportello (Joaquin Phoenix). Doc’s 1970s life unfolds in a pot-induced haze that keeps him wandering through post-Manson, hippie detritus in a fictional town called Gordita Beach. If the private eye was staple of 1940s Hollywood, he’s reduced to blood-shot eye by Anderson, less a savvy guy with his own moral code than a bemused idler. The movie opens when Sportello is visited by a former girlfriend, the elusive Shasta Fay Hepworth (Katherine Waterston). It seems Shasta Fay has become the lover of real-estate magnate Michael Z. Wolfmann (Eric Roberts). Wolfmann has disappeared and Shasta Fay wants Sportello’s help to locate him, presumably to save him from those who would put him in a sanitarium — or something like that. At this point, I’m going to let the ship that’s carrying the Anderson/Pynchon plot sink. No more attempts to recount what can’t be recounted. The plot is a blur of dodges, gestures and noir mimicry. Trying to follow it is a bit like getting lost in a new town without benefit of a map or GPS. You either panic and scream or you decide to enjoy the strange sights. For me, these sights are embodied in the form of characters who enter the movie like figures from a pop-up book. Sauncho Smilax (Benicio Del Toro). He’s Sportello’s lawyer, a guy who seems like a refugee from a Hunter Thompson story. Lt. Detective Christian F. “Bigfoot” Bjornsen (Josh Brolin), an LA cop who specializes in civil rights violations. Dr. Rudy Blatnoyd (Martin Short), a dentist who wears purple suits and heads a mysterious ring called Golden Fang. Coy Harlingen (Owen Wilson), a saxophone player who’s presumed to have died, but whose wife (Jena Malone) thinks he’s still alive. You can tell by the character names that Pynchon’s universe is one of broad comedy carved with a satirist’s knife. I’m putting off my assessment for a bit because (as a matter of public service) I want to share with you the way that I watched the movie. I tended to drift in and out of the various episodes. While each was unfolding, it held my attention, but as Anderson shifted from one bit to the next, I had difficulty remembering exactly where I’d been. I enjoyed the music — both Jonny Greenwood’s score and the tunes selected by Anderson to accompany various segments. I chuckled. My mind wandered. I chuckled some more. My mind wandered some more. When Reese Witherspoon showed up as Deputy DA Penny Kimball, I was amused to see her. She’s one of Sportello’s sexual companions and informed sources. I felt a sense of alienated indifference as the characters exchanged information that seemed important to them, but left me shrugging. The movie’s narration — delivered by Joanna Newsom as a character named Sortilege — sometimes approaches Pynchon’s eloquence, but doesn’t necessarily clarify much of anything. Two performances are of special note. Phoenix, who appeared in Anderson’s The Master, brings stoned integrity and his own level of confusion to the role of Sportello. He’s best in scenes in which he squares off with Brolin’s Bigfoot, a character who becomes a bold parody of a quintessentially starched Los Angeles detective. Bigfoot has a crew-cut and a fondness for phallus-shaped popsicles. Unashamedly brutal and a man of porcine appetites (he’s always eating), Bigfoot stands as a kind of one-man satire of law enforcement at its worst. Now, what to make of all this? You can probably tell from the tone of this review that I’m not ready to rip into Anderson’s movie. I hope you also can tell that it’s an experience to which not everyone will take. The old adage — it helps if you’re stoned — may be applicable here, an observation I offer not as an encouragement for pot smoking, but as a guidepost to the experience that awaits you. I enjoyed some of the movie’s asides, watching Bigfoot in a non-speaking role in Adam 12, for example. On top of everything else, the guy wants to be on TV. Martin Short made me smile, as did Sportello’s visit to a massage parlor in the middle of nowhere. I’m sure I’m leaving something out. The neo-Nazis who guard Wolfmann perhaps? I’m not sure it matters. Was a time when I might have gotten more pleasure from this meander through a lost moment in the counterculture moors. I suppose in the end, Anderson didn’t totally convince me that Pynchon’s work should be brought to the screen, even with the help of the gifted cinematographer Robert Elswit who coats each scene with downside lacquer. If you’re an Anderson fan (and I mostly am), you probably owe it to yourself to give this one a try. If you’re a Pynchon fan, you’re already used to plots that leave you scratching your head. Everyone else? I’d say that the movie unfolds as a series of digressions from... well... let’s talk. Did I feel hostility toward Inherent Vice? Not really. Did I like it? Sometimes. Was I bored by it? Occasionally. Would I watch it again? Not immediately. Probably someday. Who knows?